256 pages | 56 B/W Illus. Developed by Jean-Paul Benzérci more than 30 years ago, correspondence analysis as a framework for analyzing data quickly found widespread popularity in Europe. The topicality and importance of correspondence analysis continue, and with the tremendous computing power now available and new fields of application emerging, its significance is greater than ever. 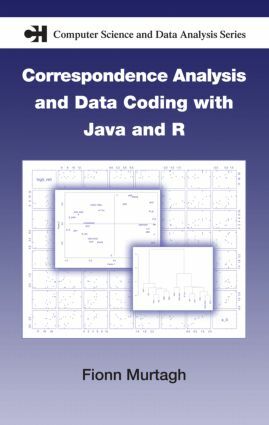 Correspondence Analysis and Data Coding with Java and R clearly demonstrates why this technique remains important and in the eyes of many, unsurpassed as an analysis framework. After presenting some historical background, the author presents a theoretical overview of the mathematics and underlying algorithms of correspondence analysis and hierarchical clustering. The focus then shifts to data coding, with a survey of the widely varied possibilities correspondence analysis offers and introduction of the Java software for correspondence analysis, clustering, and interpretation tools. A chapter of case studies follows, wherein the author explores applications to areas such as shape analysis and time-evolving data. The final chapter reviews the wealth of studies on textual content as well as textual form, carried out by Benzécri and his research lab. These discussions show the importance of correspondence analysis to artificial intelligence as well as to stylometry and other fields. This book not only shows why correspondence analysis is important, but with a clear presentation replete with advice and guidance, also shows how to put this technique into practice. Downloadable software and data sets allow quick, hands-on exploration of innovative correspondence analysis applications. "Detailed examples of its application to data are drawn from an astonishingly wide variety of fields; astronomy, financial modeling and forecasting, comparisons of prehistoric and modern groups of dogs, ancient goblets and measurements on ancient Egyptian skulls. …All in all this book can be recommended as a succinct reference on all aspects of correspondence analysis, theoretical, computational, and practical." "This book plays an important role in bridging the gap between learning a method and actually implementing it . . . could serve as either a text for an introductory course on CA or as a supplementary text to a more advanced graduate course in CA or multivariate techniques in general . . . The author should be commended for bringing these issues to the forefront."